Colony collapse: are the bees getting lost? As honeybee colonies in the United States and Europe continue to suffer from a mysterious syndrome called colony collapse disorder (CCD), scientists are scrambling for answers. Another answer arrived this week, with a publication1 that implicates a widely used insecticide. Photo: The Holy Hand Grenade! 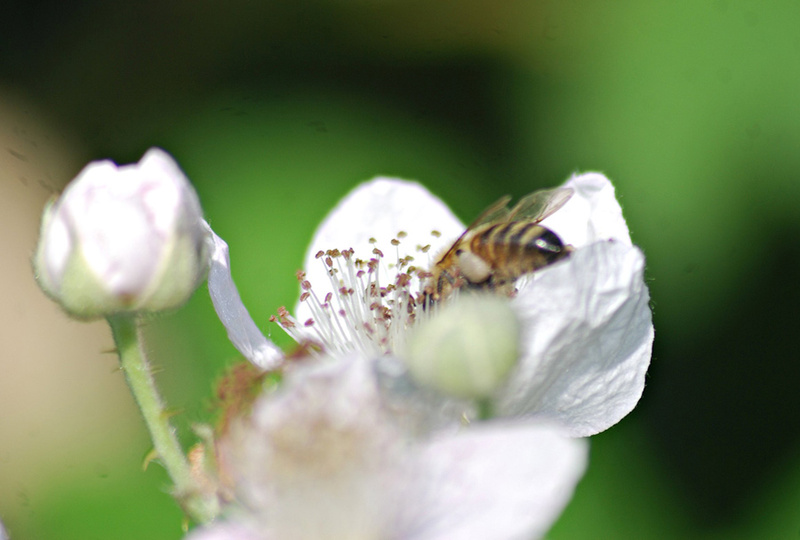 CCD endangers many crops, but none more than almonds, which are pollinated by bees in more than a million hives trucked to California during the flowering season. Trucking stresses the bees, and stress is one of several likely contributors to the collapse syndrome. Indeed, CCD could be several conditions lumped under one name, but here’s the trademark: The bees die away from the hive, obscuring the cause or causes of the collapse. 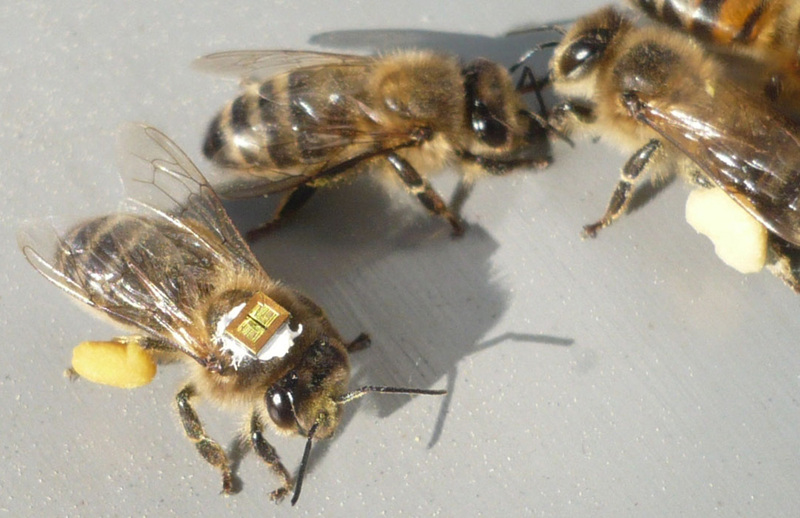 In the new study, scientists in France glued radio frequency identification tags to bees. Half were fed non-lethal doses of thiamethoxam, a common insecticide, then all the bees were released 1 kilometer from the hive. At the hive, the scientists used a radio-frequency gizmo to count how many flew home. * 76 percent of insecticide-treated bees. * 57 percent of insecticide-exposed bees. In any case, the control bees also sported tags. 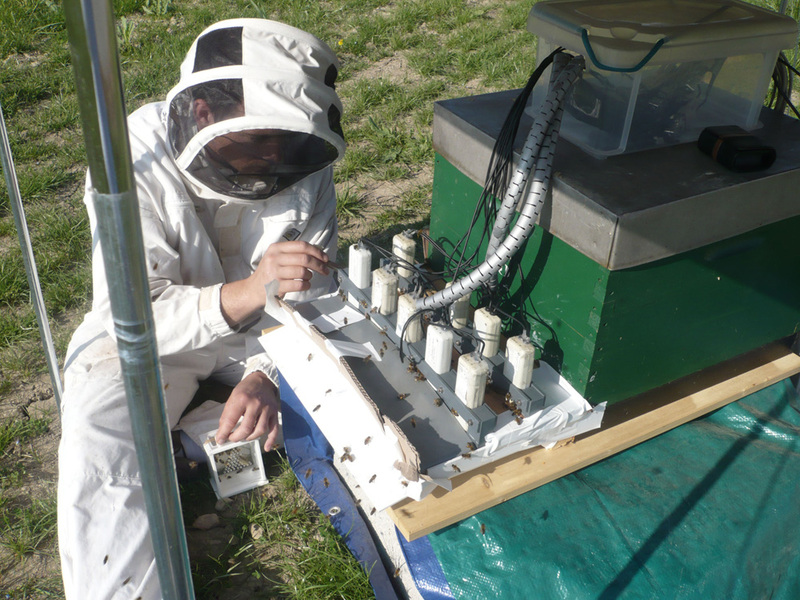 A 3-milligram RFID tag identified this honeybee in the return-to-colony experiment. The vacuum collects honeybees at the entrance of an experimental beehive. How did the insecticide reduce the return rate so significantly? Most likely by causing difficulties with orientation, or locomotor activity, or both, Henry says. When the experiment was repeated over a distance of just 70 meters, 92 percent of exposed and 98 percent of control bees returned, so both sets of bees were able to fly. The major impairment of exposed bees on the unfamiliar, longer route suggests that the insecticide was most damaging to the ability to learn a new route. 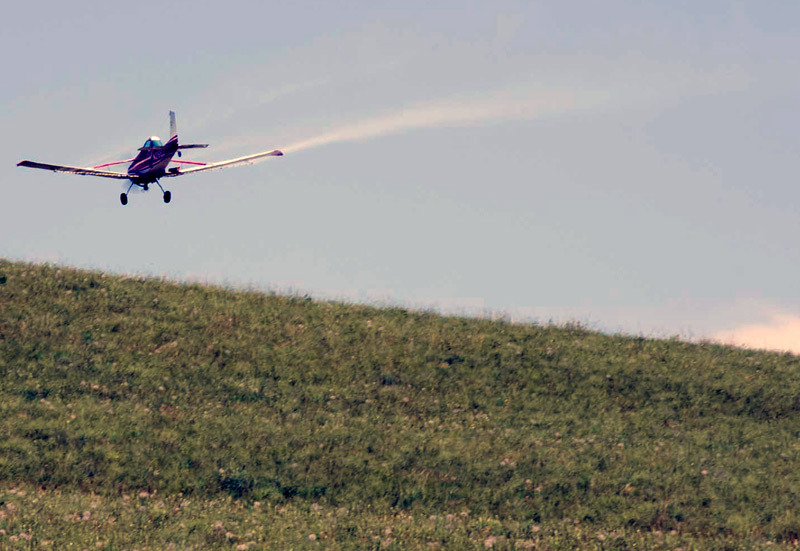 A plane sprays insecticide on rangeland on the Crow Indian Reservation near Hardin, Montana. Insecticides and other agricultural chemicals may play a role in colony collapse disorder, along with pathogens and pests. These insecticides make bees stupid, in other words.